Rough running engines are difficult to troubleshoot at times, especially if the malfunction is intermittent. Most problems are ignition or fuel related and can be remedied by cleaning a spark plug or an injector. At other times, the cause of the trouble can be a little harder to find. The cylinder assembly is the heart of a reciprocating engine. It is in the cylinder that the chemical energy stored in fuel is converted to mechanical energy. Airplane cylinders must endure the extreme heat and pressure produced by the burning of the fuel mixture. They must also withstand the wear generated by the friction of moving parts. A compression test will reveal a lot about the internal mechanical parts of the cylinder and is good for diagnosing piston ring wear or a valve that is not fully closing. However, compression tests may not reveal a defect with a valve that has excessive deposits between the valve stem and guide—until it becomes bad enough to cause the valve to completely stick. A valve that is not completely stuck, but is intermittently being hung up and slowed down in the guide, can cause compression loss in the cylinder it is installed in while the engine is running, but can open and close completely when the engine is pulled through by hand. Sticking valves are caused by excessive deposits of lead or contaminants in the valve guide or by valve seat wear which allows the fatter bottom part of the stem to travel farther than it is supposed to up into the bottom of the guide when the valve is closing—the latter is especially true on the small Continentals. It then takes more pressure than normally required on the rocker arms and push rods to open it again. Eventually, this can cause damage to the affected lifters, push rods, or cam lobes. Valve seat wear can be detected by checking the clearance between the top of the valve stem and the rocker arm with a feeler gauge. The crankshaft has to be rotated so that the affected cylinder’s piston is at top dead center on the compression stroke. Engines other than the Lycoming O-235 use hydraulic lifters. Hydraulic lifters are designed to eliminate clearances between moving parts in the valve train and keep them in constant contact with each other while still allowing free motion of the valve train. These have to be bled down to accurately check the clearance. This is accomplished by gently pushing the rocker arm down on the push rod side and releasing it with the cylinder piston positioned at top dead center on the compression stroke. The applicable engine overhaul / service manual will detail allowable clearances. 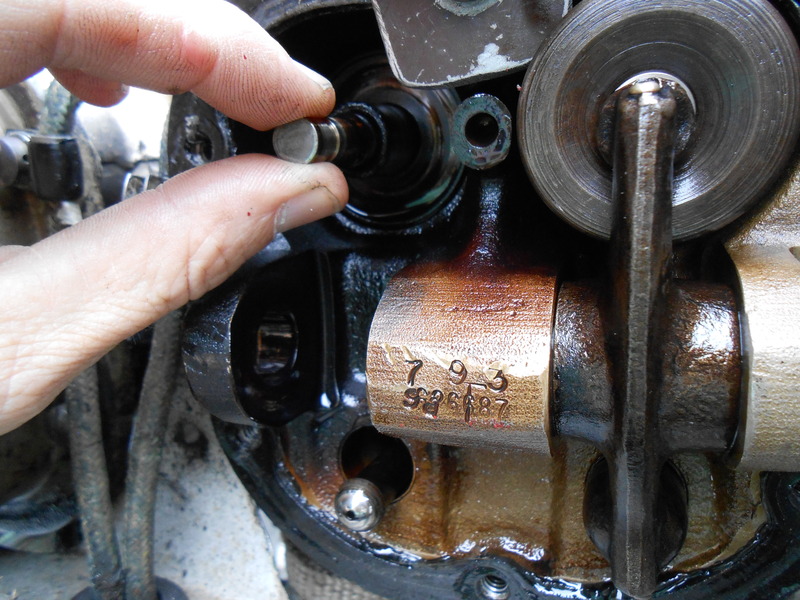 Lycoming Service Instruction 1425A gives a maintenance procedure to detect valve guide contamination and reduce the possibility of valve sticking by cleaning the valve guides without having to pull the cylinder. The procedure works on Continental engines as well. First, the rocker box covers and spark plugs must be removed. (It helps to pull the exhaust manifold also, but it’s not always necessary.) Then, the crankshaft is rotated so the cylinder being worked on has the piston at the bottom of its compression stroke. After the springs and keepers are removed, the valve is held in place with mechanical fingers or a magnet while the rope is removed from the cylinder. It can then be positioned in the cylinder so that the stem protrudes out the bottom spark plug hole where it can be cleaned and inspected. The guide itself will have to be gently reamed to remove the deposits. The reamer should be worked by hand so that there is little chance of accidentally removing metal from the guide along with the deposits. Coating the reamer flutes with grease will help remove the deposit material with the reamer. Once the reaming process is complete, the guide should be cleaned out with a solvent and blown out with compressed air. The process is then the reverse of the removal; the valve is moved back into the guide and the rope is re-inserted in the hole to allow the springs and keepers to be installed. TIP: Proper leaning of the mixture (especially if carburetor heat is being applied) helps to prevent the formation of excessive deposits in the cylinder. Many owners also regularly use fuel additives, like Marvel Mystery Oil, to aid in the lubrication of the valve guides.